The Patient Aid Full Body Mesh Sling is made for most patients using a lift sling looking for a safe, supportive, comfortable and easy to use sling to transfer them in and out of bed to a chair, wheelchair, toilet or to pick up a patient off the floor. This Lift Sling Fits Hoyer(R), Invacare(R), Drive(R), Medline(R), Lumex(R) and most other patient lift brands. The Full Body Mesh Sling is made with a Polyester Mesh Material that protects those patients with sensitive skin while also preventing the patient from sliding. The Polyester Mesh sling is ideal for bathing and is breathable to allow the patient to stay on the sling without retaining body heat. The Full body mesh sling offers total head, neck and thigh support along with an outside handle that allows the caregiver to reposition the patient in their wheelchair, chair, toilet or up in bed. The Full body mesh sling has four reinforced attachment points to allow the sling to work with all competitive floor style patient lifts and their 2, 4 or 6-point spreader bars. 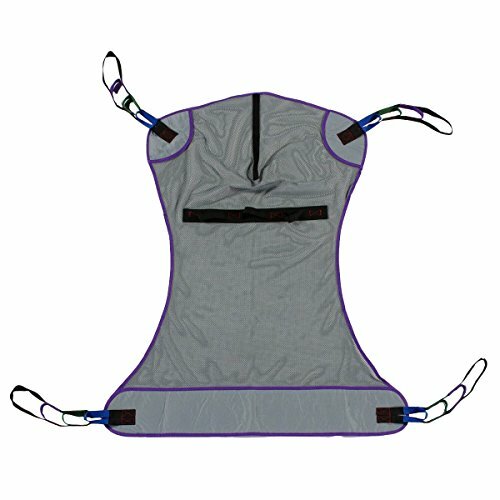 The 600lb weight capacity allows the full body mesh sling to accommodate a wide variety of different size patients and their specific needs. Size Large. Recommended patient weight range of 225-350lbs. 1 year warranty. Outside guide Handles for assistance in positioning the patient in the wheelchair, commode or bed. Color coded loops inside the positioning straps help align the sling properly on the spreader bar. Chain Free design protects patients skin and hair from getting pinched or injured in the chains. Can be used with any 2, 4 or 6-point lift spreader bars. Four reinforced hookup points that work with any competitive floor style patient lifts. If you have any questions about this product by Patient Aid, contact us by completing and submitting the form below. If you are looking for a specif part number, please include it with your message.